This is a project anyone can do—if you’re careful. 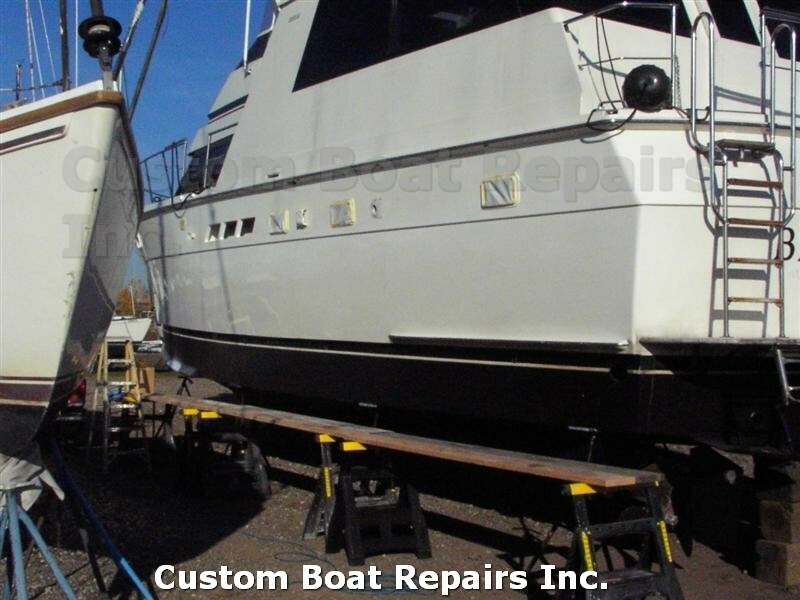 Compounding your boat yourself can save around $400.00 a year. In this section I show you the tools and materials you need to do the job correctly. 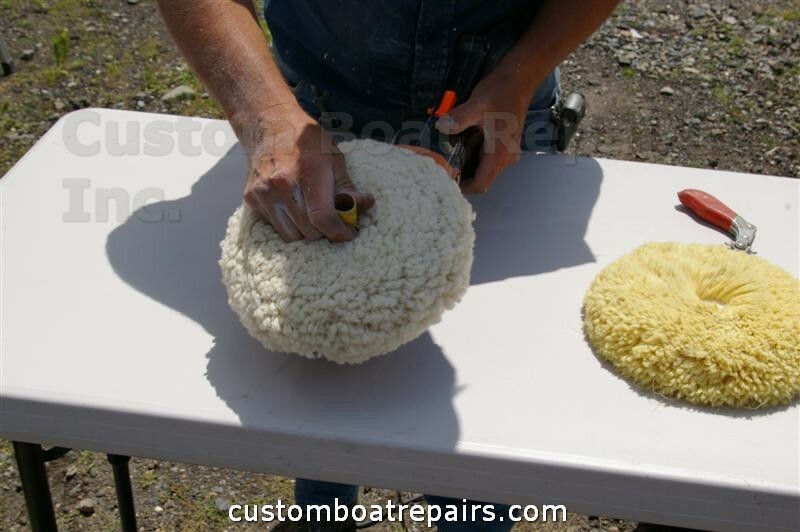 When I compound a boat, it is a three-step process. This means I go over the boat three times with the buffer. First, I use a coarse compound to remove oxidation stains. 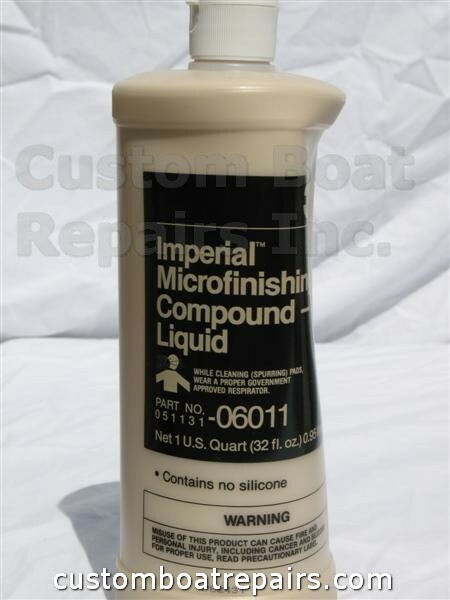 Second, I use a microfine compound to remove the swirl marks from the coarse compound. 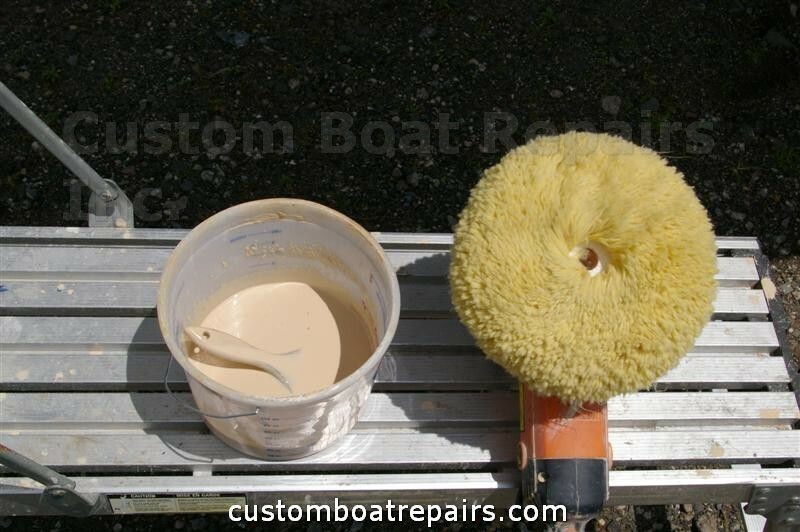 For the third step I use a glaze finishing compound to bring up the true color and shine of the boat. 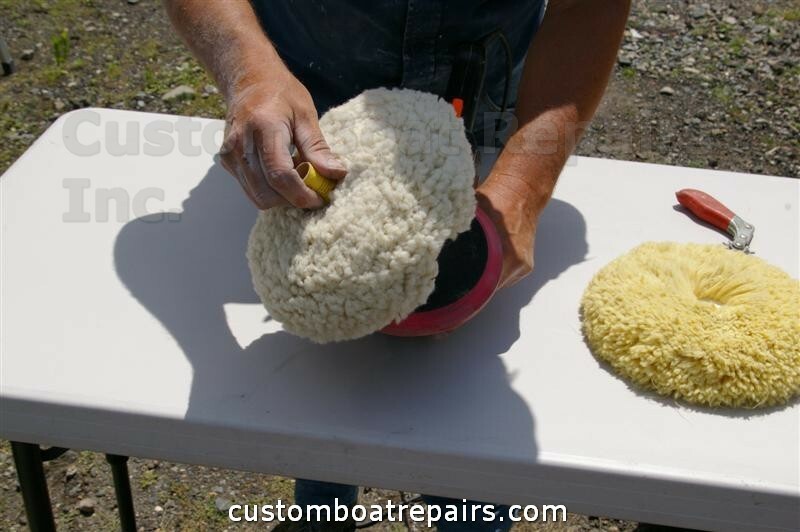 I don’t compound whole boats anymore because I have so much fiberglass work to do, although customers have asked me to start a company specifically for compounding. Through the years I have found that if you don’t keep an eye on your workers, they’ll always come up with a quicker way to do the job and sacrifice quality. 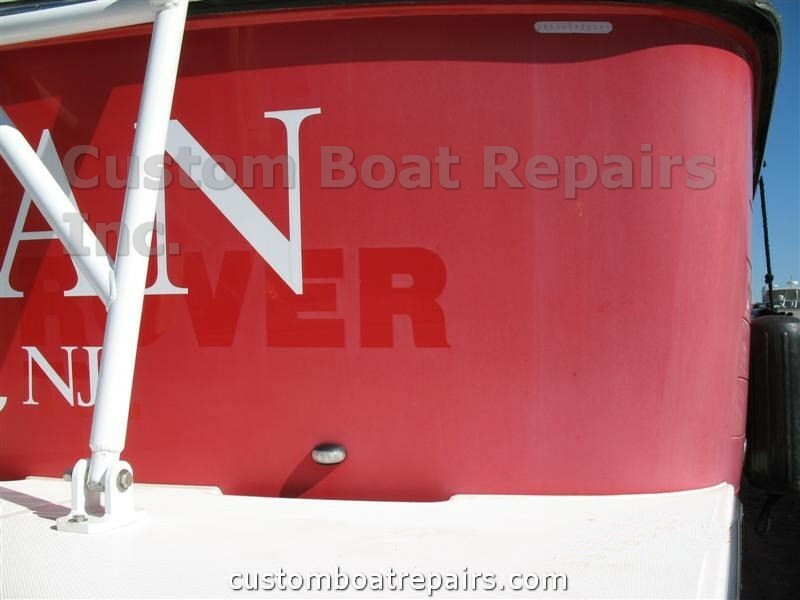 If your boat is badly oxidized (most noticeable when color gel-coated boats have dramatically faded), compounding will only restore its original shine for a few months. 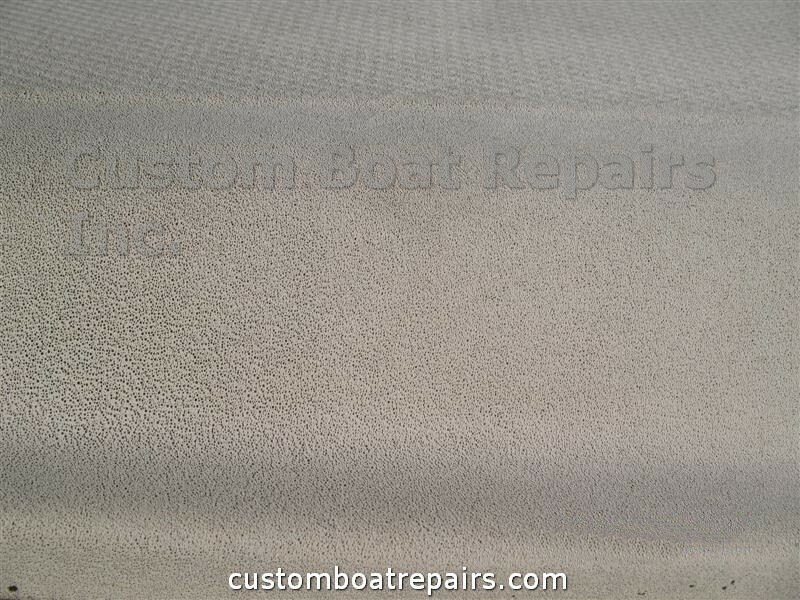 If your boat’s gel coat is porous, like in the photo, do not compound it. 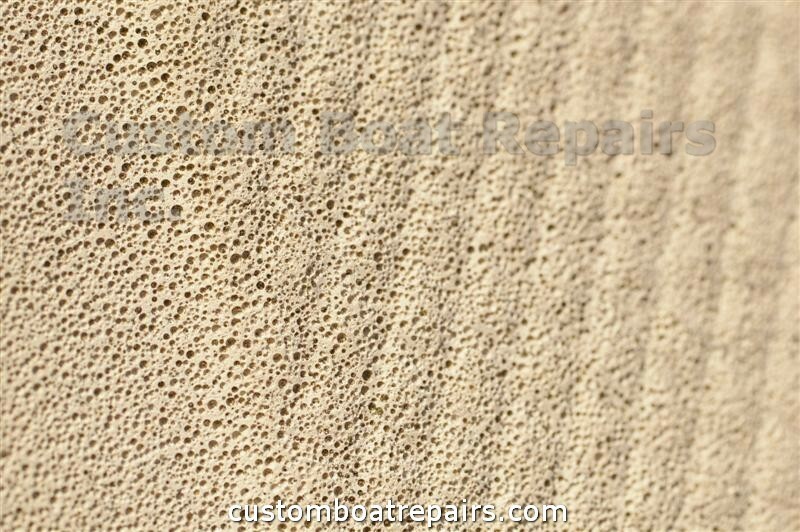 If you try compounding a porous boat, the compound will just fill the holes and your boat will be the color of the compound. Just enjoy the boat for what it is. When buying a buffing machine, make sure it has variable speeds. 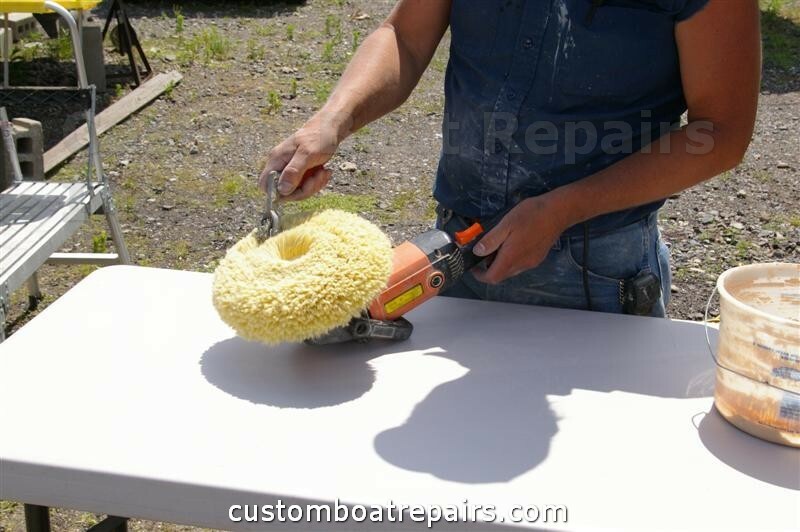 This helps when you buff around boat cleats and railings (the lower speed is used to buff around objects). If you touch a cleat using a single-speed buffer, the buffer might hook it and possibly break your arm. The force from an uncontrolled single-speed buffer can also throw a person off a ladder. I’ve seen it happen. I don’t recommend using a ladder to compound big boats. 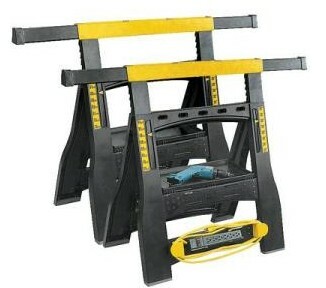 I use adjustable saw horses with wooden planks placed on top (which can be purchased at Home Depot or Lowes). This gives you a more stable center of gravity to control the buffer. On a ladder you’ll be reaching to buff certain areas and could possibly fall off. 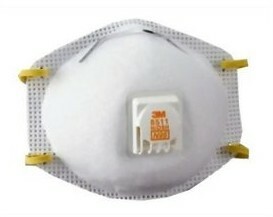 Wear a breathing mask. The silica dust from compounding is not healthy to breathe in. Wear sunglasses or safety goggles. If the silica dust gets in your eyes, they will tear all day long. 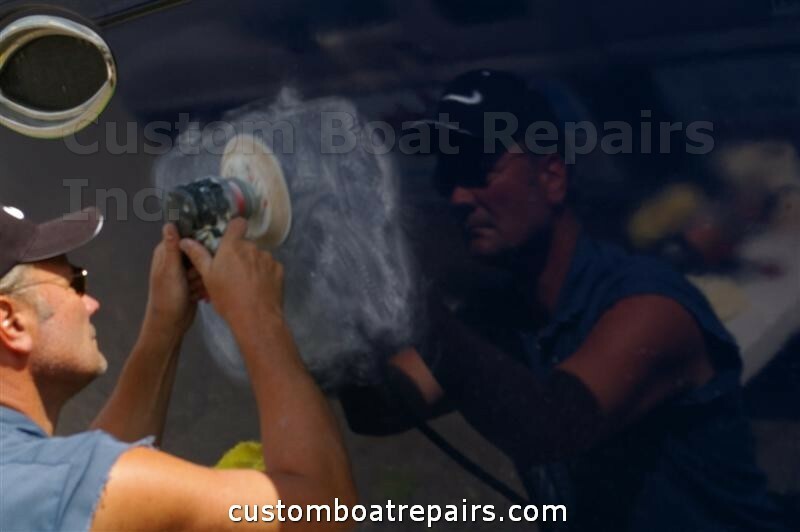 Before you begin buffing, wipe your boat down with fresh clean water to remove dirt and salt residue. 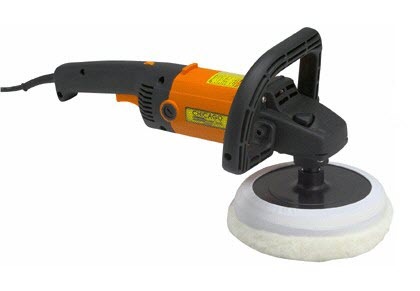 Keep all buffing pads clean with the pad-cleaning tool. After you compound a small section, check the pad. If it is all gummed up, clean it out. If you don’t, the buffer will not cut the finish fast, and a section that should take an hour will take two. If the compound you’re using is a thick paste, thin it out with water. This will make the compound cut faster. The thicker the compound, the faster it clogs the pad and makes the job longer. Keep the buffer moving back and forth (both horizontally and vertically) using medium pressure on the right edge of pad. 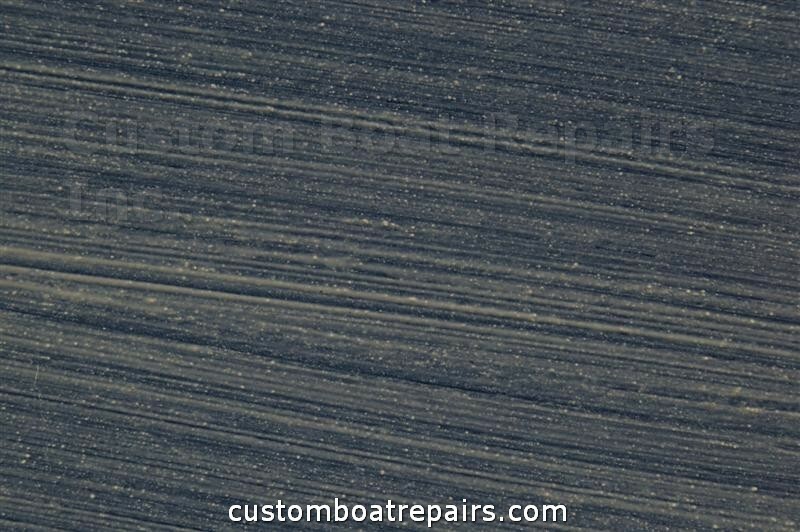 If you go too slow in only one direction, your boat will look like it has zebra stripes on the hull when you’re finished. 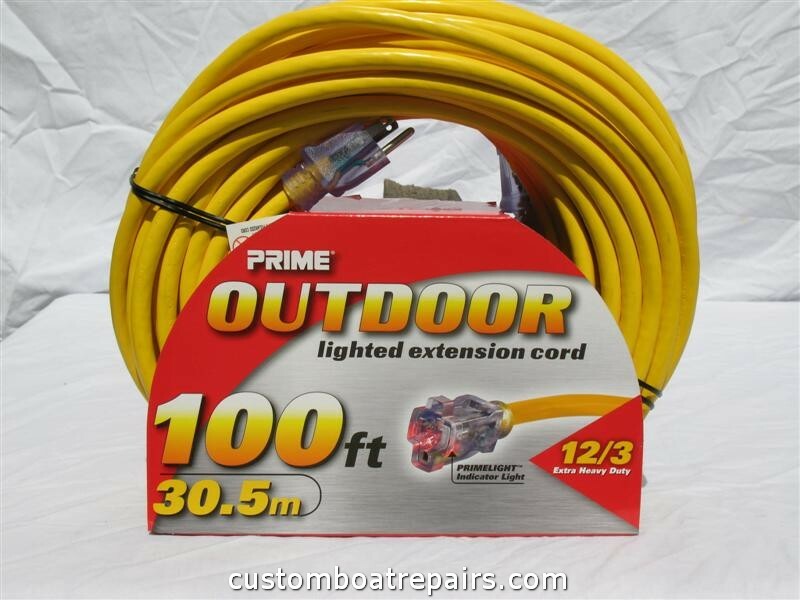 I use heavy-duty extension cords. The extra weight holds down the cord when buffing. Lighter cords can get caught in the buffing wheel, And two bad things can happen: One, the wheel catches the cord and twists your arm until you give up, or two, the cord breaks and you have a live wire sparking at you. There are many companies that sell buffing pads. I’ve used 3M to my dissatisfaction. After I’ve removed and replaced their pads a few times, they tend to fly off the machine while buffing. 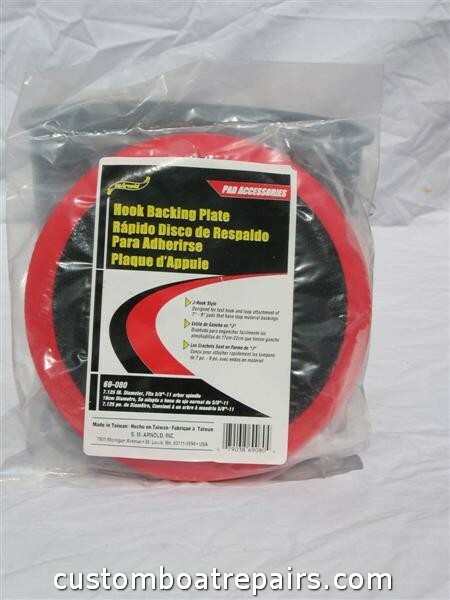 In my opinion, the SM Arnold hook and loop (Velcro) pads hold up the best. Do not use the backing plate that comes with the buffer. It’s not flexible enough. A better option is the SM Arnold 69-080 backing plate. Warning: If you don’t have the right tools, or the ability, then do not attempt this procedure. 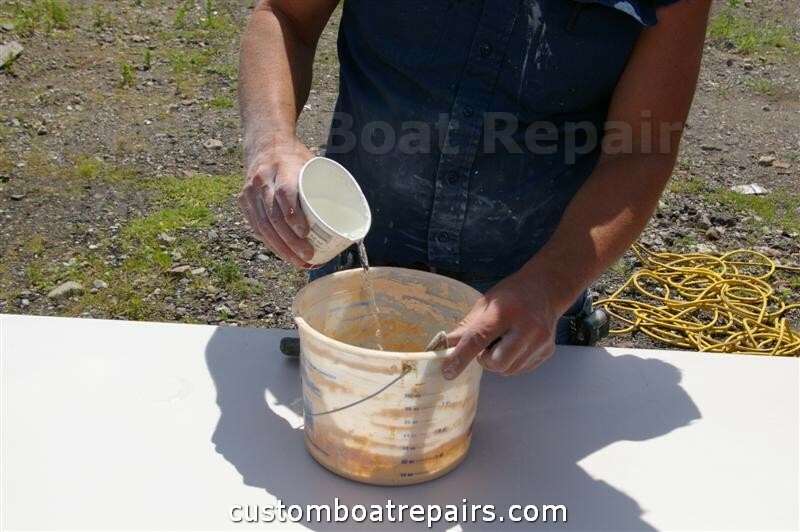 Do It Yourself Step-by-step Photo Guide: How to compound your boat. 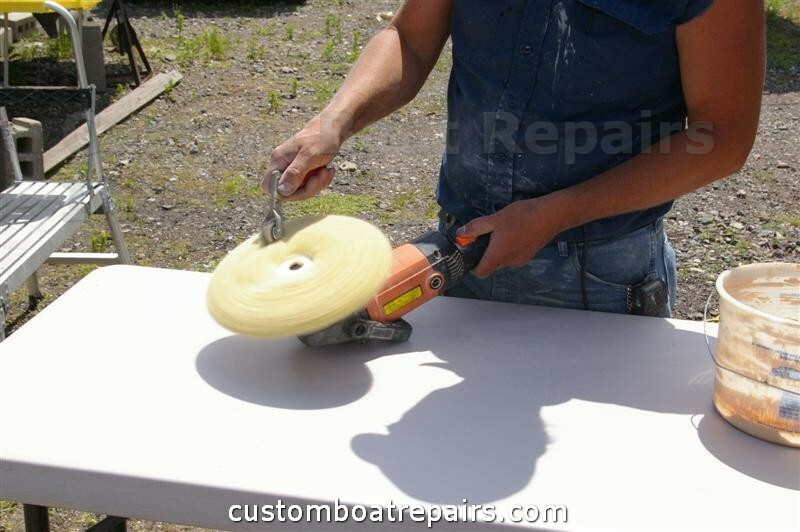 In this photo you can see how I use the adjustable saw horses to work on a very big boat. This setup offers more stability than a ladder would. With this setup, I can work on a 36-ft-long section of the hull without climbing up and down. 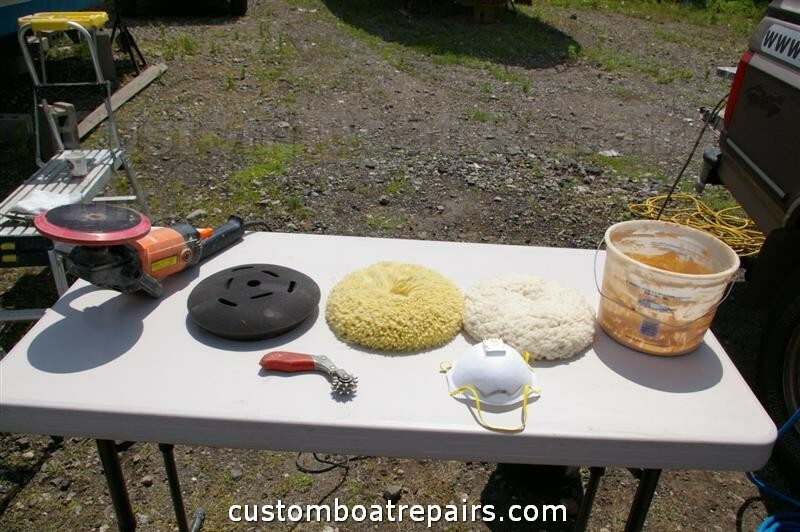 Get a portable table and lay out your buffing supplies. The table makes it easier to change pads and mix the compound. 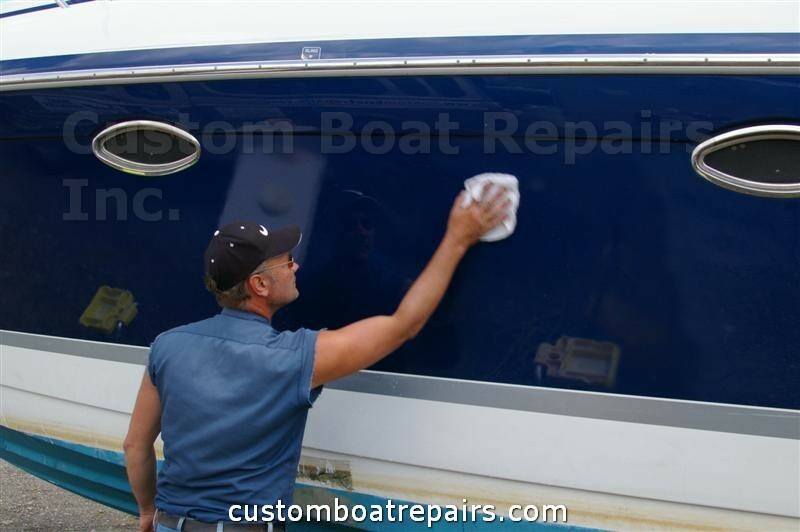 Get five gallons of water or a garden hose to wash the side of the boat to be buffed. Wipe it down wet, then wipe it dry. This is what you want to get off the boat. This is salt water residue. You can see how gritty it looks. 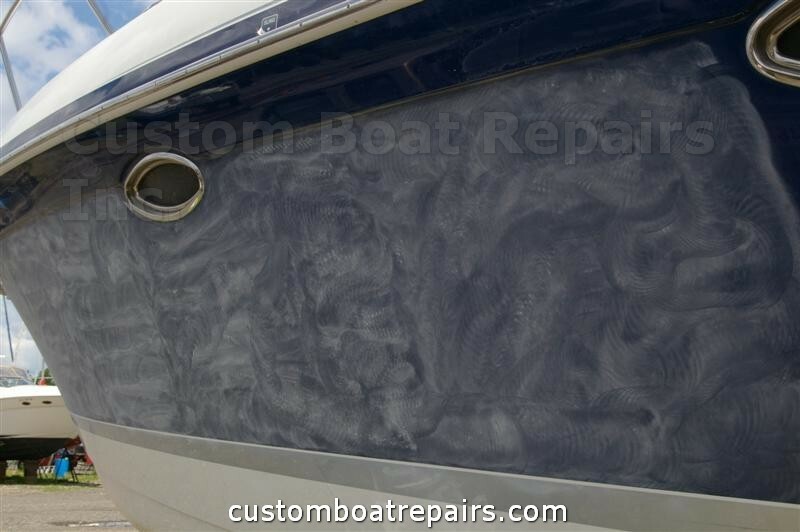 This boat had to be sanded because there was a lot of dirt from the factory in the finish. In this case, you sand it smooth with 1000-grit sandpaper, then buff it up. You can omit this step if the surface is smooth. 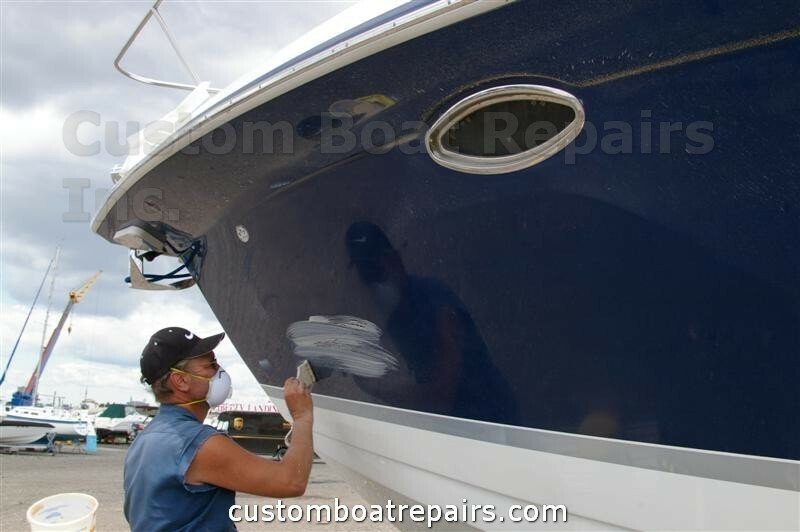 If the surface is faded, then it would be a good idea to remove the oxidation first and then buff it up. This is what the side looks like after it has been sanded. You don’t want to sand too much. Just go over it lightly. Here I’m mixing up my own compound. It’s in a thick paste form. Now I'm thinning out the compound with water. You want the compound to have the consistency of milk to heavy cream . This formula will cut your time in half. Now you install the backing plate (SM Arnold 69-080) to your buffer by pressing the button by the threaded spindle on the buffer; this will lock the spindle for you to thread on the backing plate. 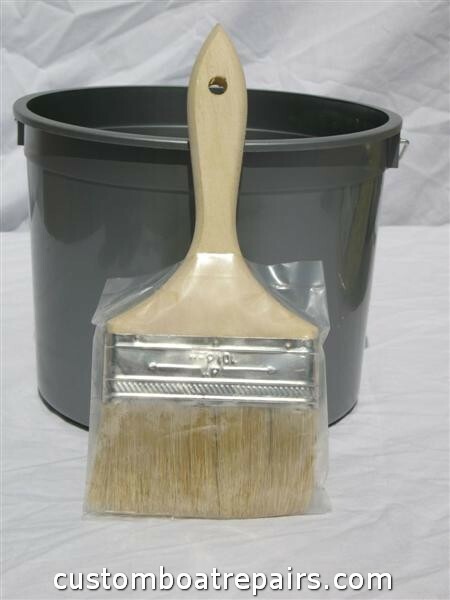 Remove the white buffing pad (SM Arnold 57-375) from the bag. There will be a small cardboard tube to align the buffing pad to the backing plate. Place the tube in the pad and align it to the hole in the backing plate. Press the pad down hard. Remove the cardboard tube. Make sure the pad is firmly attached to the backing plate. Now remove your hands from the pad, hold up the buffer, and turn it on, starting slow and building up speed. If the buffer runs smooth, you did a good job. 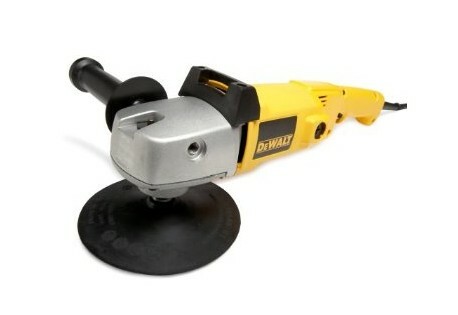 If it runs rough and shakes, you didn’t align the buffing pad to the backing pad properly. Remove the pad, realign it, and try again. The buffer needs to run smoothly or else it will be very dangerous to operate (and the shaking will tire out your arms). 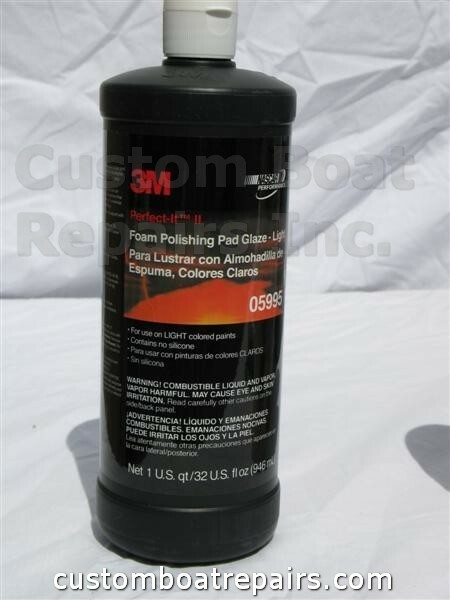 Use compound 3M 05954 to remove stubborn stains, fading, and sand scratches from gel coat. 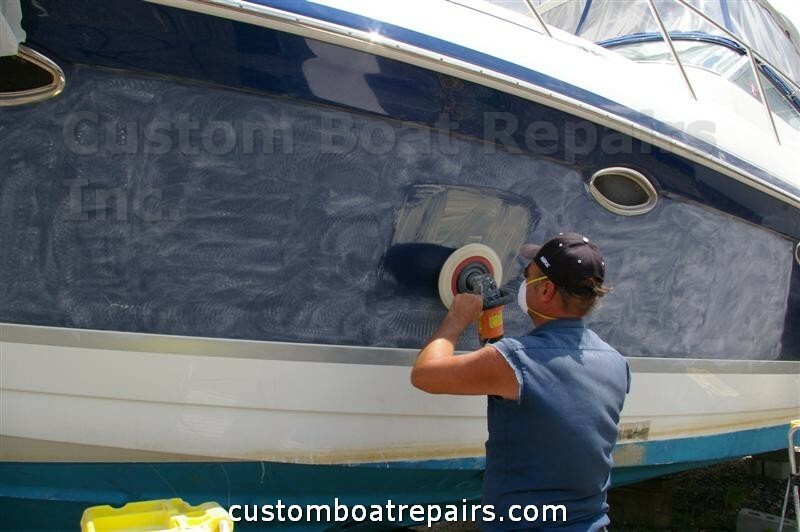 If your boat’s gel coat is in good shape and just needs to be cleaned, use compund 3M 06011. 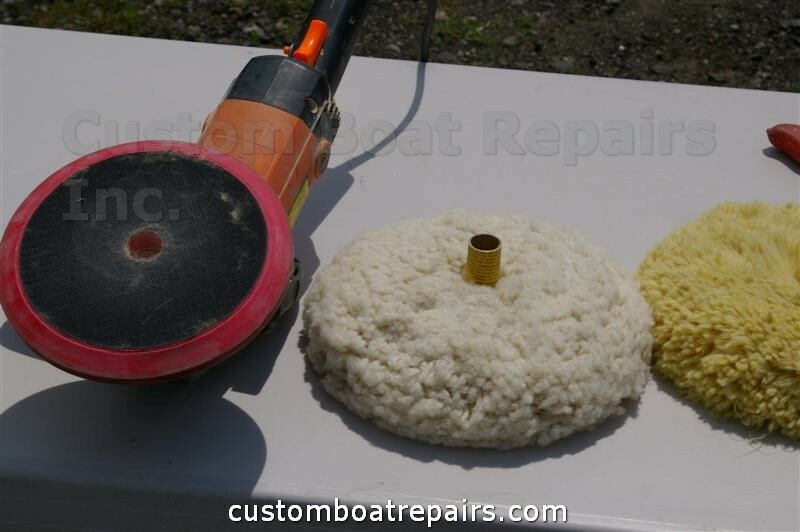 This is how the compound should look on the boat when thinned out properly. Now brush it on the boat. I usually I work on a 2' x 2' section at a time; any bigger than that it will dry out and become useless. Start up the buffer at medium speed and press it against the hull. Do not lay it flat on the surface. 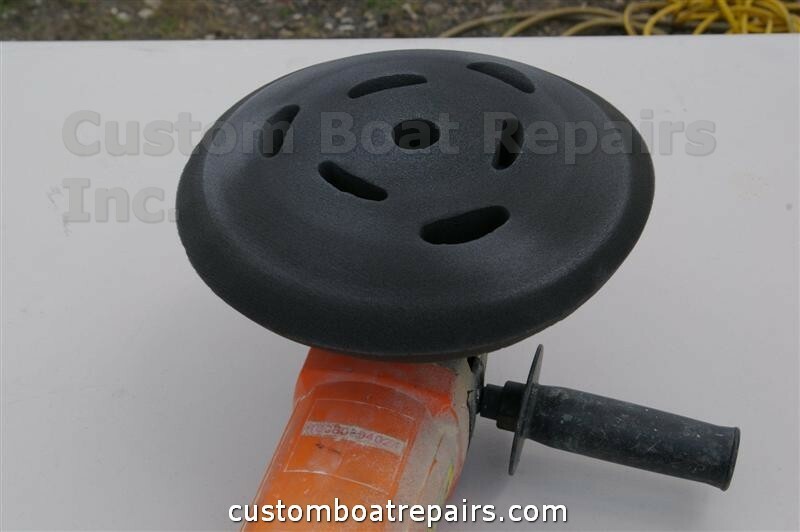 You want to have the right side of the pad touching the boat surface while the left side is about a 1/4 inch above the hull surface. You want to keep the buffer moving left to right (horizontal to the hull surface) until you see a nice shine and the compound disappears. 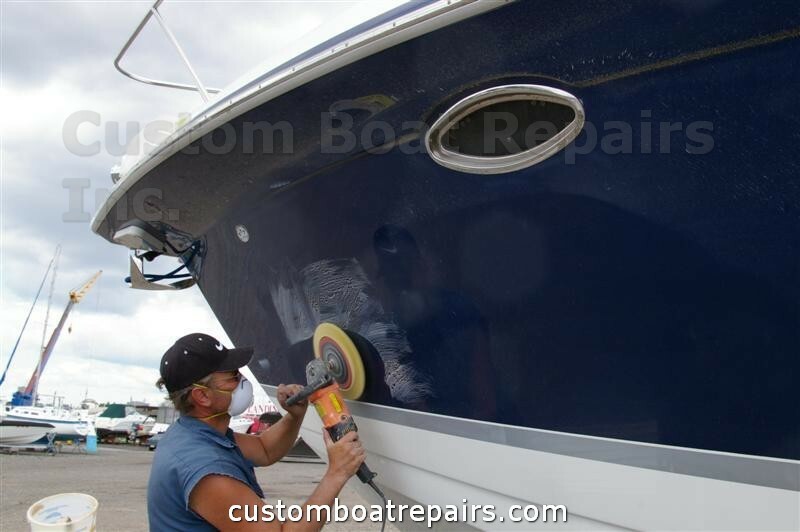 If the surface is still dull, brush on more compound and work it vertical to the hull surface. Note: You don’t want to run the buffer for a long time without compound on the surface. 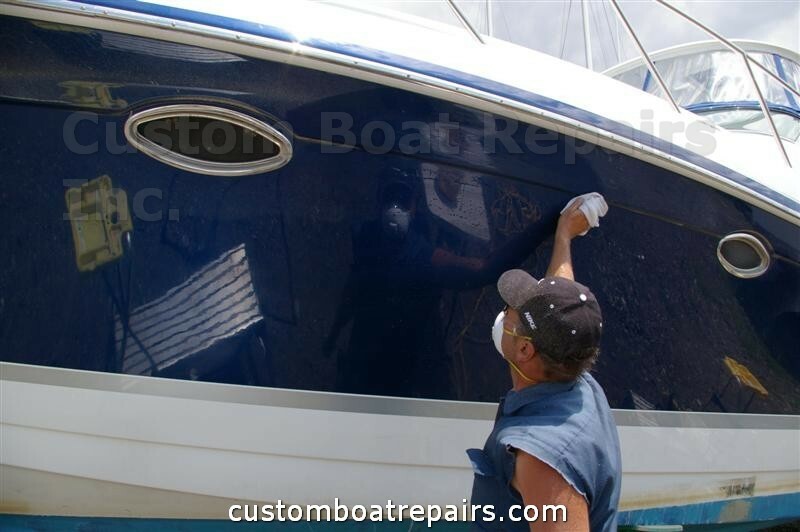 If the boat has a painted surface like many new boats do now, you will burn through the surface by creating friction heat from the buffing pad. Keep moving the buffer left to right, up and down to prevent zebra marks on the hull. Compound the whole side of the boat with the 3M Super Duty Compound. 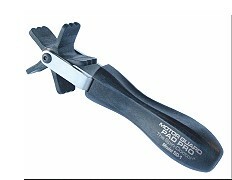 Make sure to keep the pad clean by using the pad-cleaning tool (photo below. 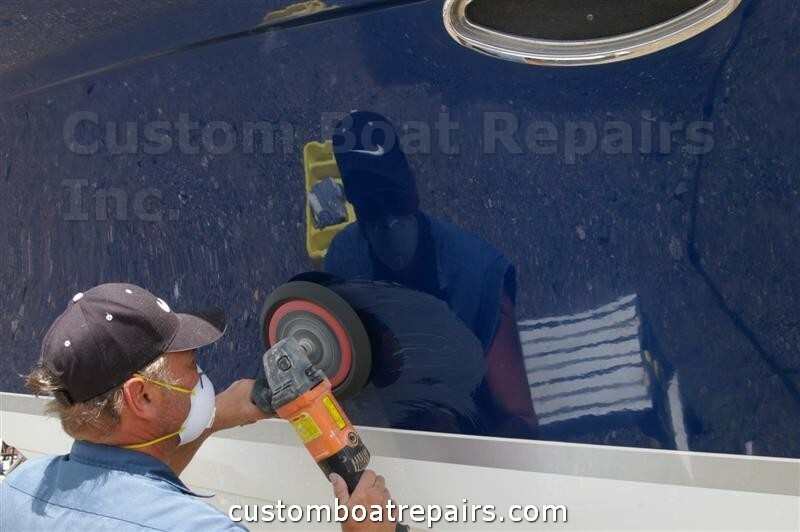 After you have achieved a nice shine on the hull, you need to remove the fine scratches. For this use 3M 06011 Microfinishing Compound with the yellow SM Arnold # 59-583 pad. 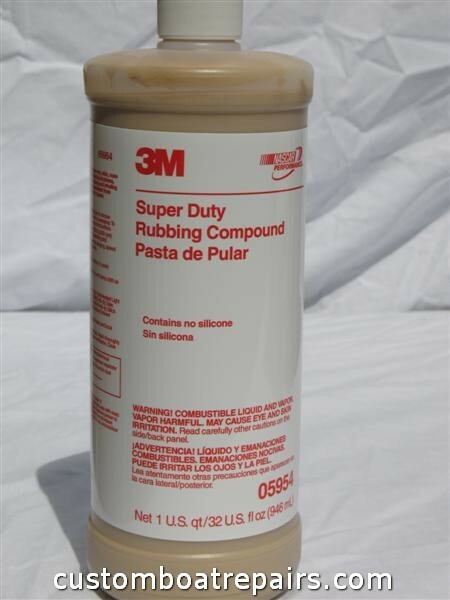 Clean out the pail and pour some 3M 06011 into it. Put the yellow pad on the buffer. Remember, when the pad looks clogged up with compound, you need to clean it out. If you don’t, it will not cut as fast and the job will become very time consuming. This is how you hold the pad cleaning tool. You have to be very careful to rest the cleaning tool on the right side of the pad ONLY. 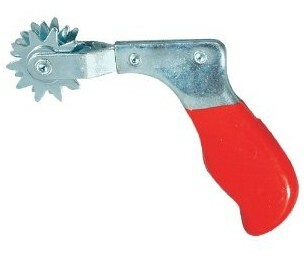 If you start on the left side, the tool can hit you in the stomach and cause injury. Here is how you clean the pad: Flip the buffer over onto the table. 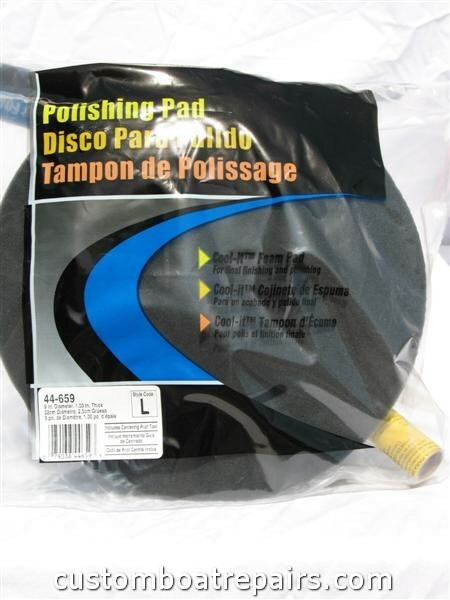 Get the pad-cleaning tool and rest it on the right side of the pad. Press the power switch lightly so the buffer starts on a slow speed. Once you get the feel for it, you can raise the speed while moving the tool back and forth on the right side of the pad only. This procedure will create a lot of dust; be sure to wear your mask. Brush on the microfinishing compound in small sections. 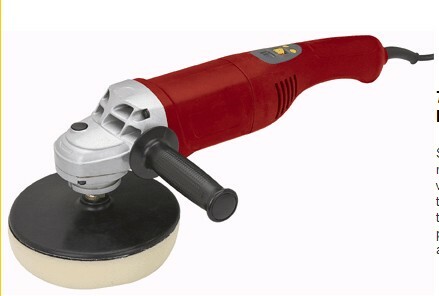 Work it with the buffing machine as described in this article. Now wash the side down with fresh water and wipe dry. Place the SM Arnold # 44-659 foam pad on the buffer. 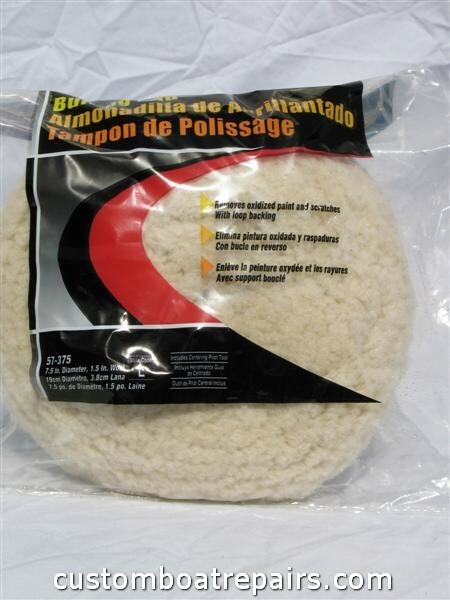 Note: The wool pad-cleaning tool will destroy this pad. 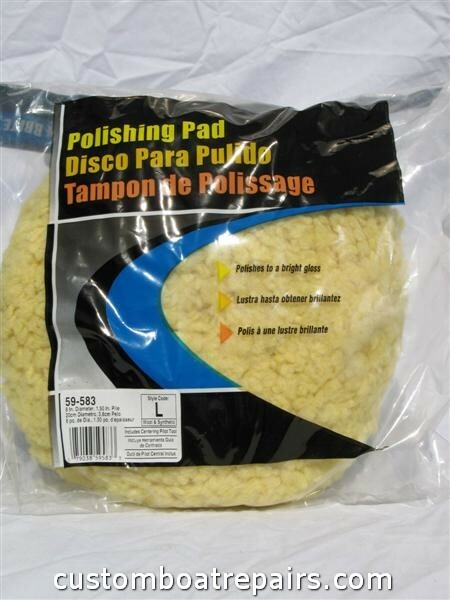 There is a special tool for cleaning a foam pad (check links section for tool number); however, in my years of using glaze coating I have never needed this tool to clean the pad. 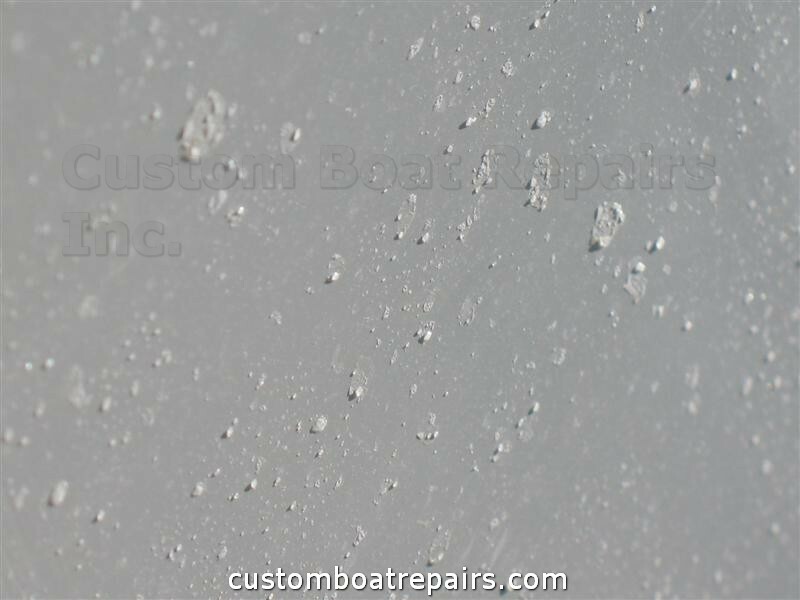 This is the glaze that you’re going to apply on the hull. 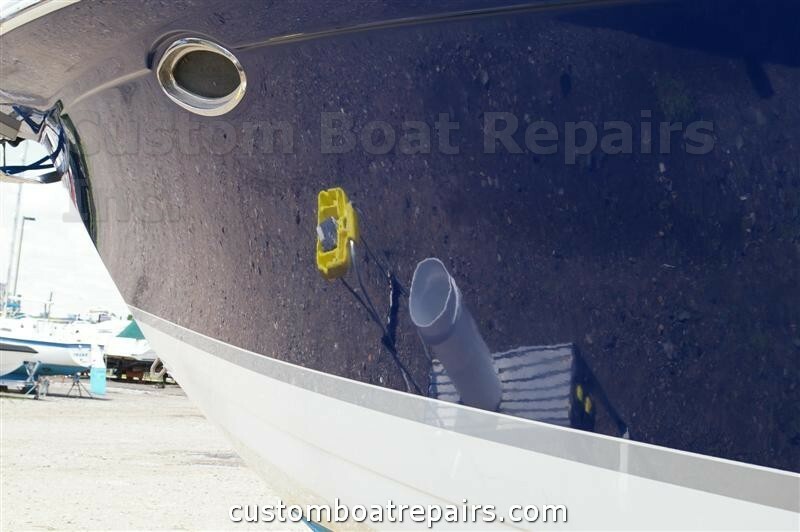 There are two types of glaze: 3M 05996 is used on dark-colored hulls while 3M 05995 is used on light-colored hulls. 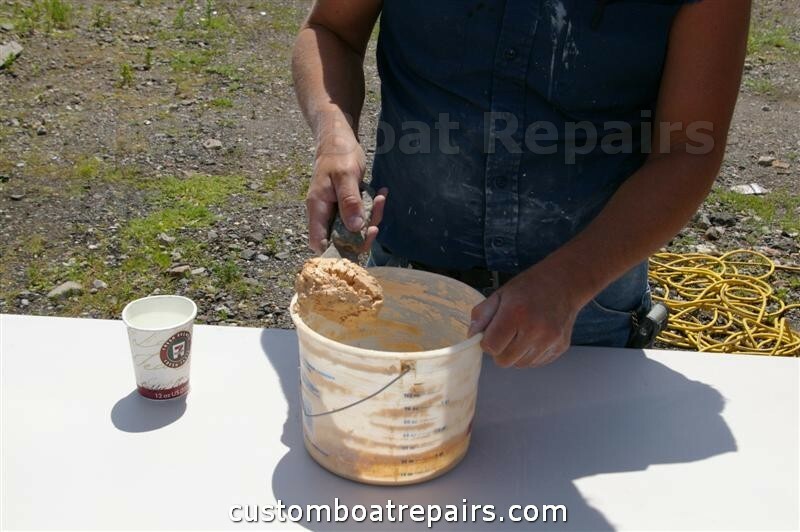 Get a paper towel or application sponge and rub some glaze on the hull. You have to work in small areas with this glaze because it dries up very fast. 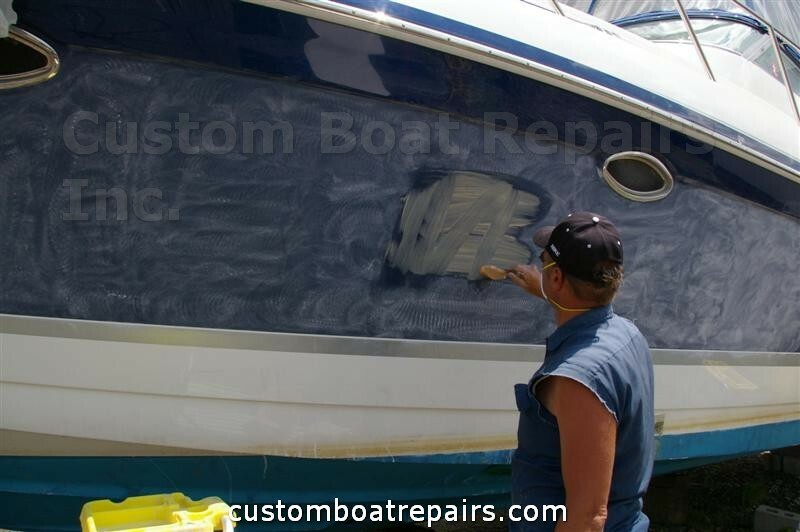 Work the area with the buffer until you see a clear reflection of yourself or the surrounding area in the hull. Here is how it should look after you follow these directions. Another angle to show the depth of the shine. Now for the wax. I’ve used many different waxes and found one called “Blue Poly,” made by Blue Corel, to be the best. Consumer Reports even gave it rave reviews. But about eight years ago the company was bought out and they stopped making it. Consumer Reports was just as upset as I was. 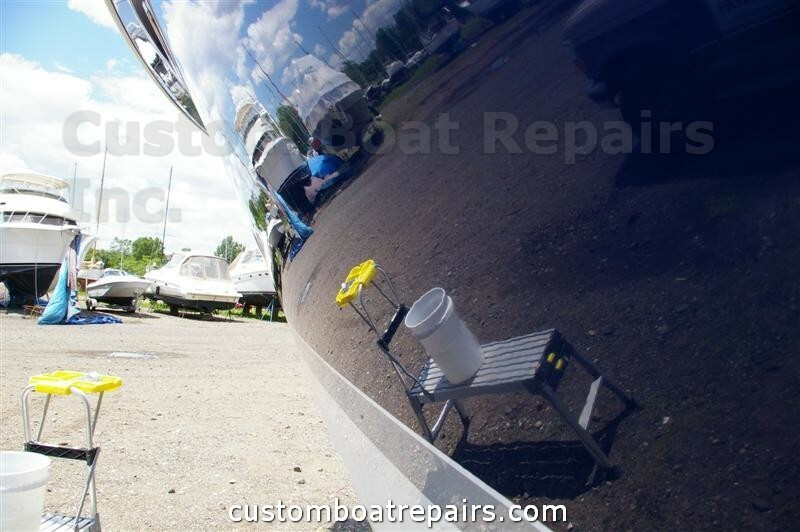 When I used that wax, the shine would last for a good year and the water would still bead up on the hull. With most waxes on the market today, you’re lucky if it lasts a month or two. 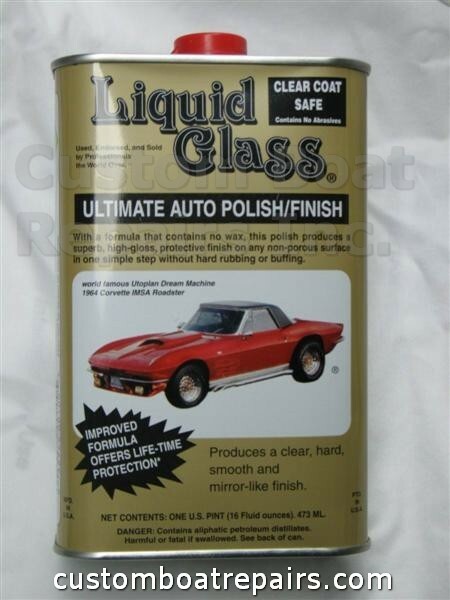 But I found something close; it’s called “Liquid Glass.” Rub this wax over the glazed areas and wipe clean. There are many buffers on the market. They range in price from $20 to $200. I tested a cheap buffer from Harbor Freight, model # 92623. I paid $19.99 for this buffer a year ago. It’s a variable speed, lightweight machine; this is why I like it. The more commercial brands make heavier machines, and when you’re compounding for a few hours a day, they make your arms ache. I used this buffer almost every day for a year. I dropped it from scaffolds a few times (it landed in dirt), and it still lasted a year before it died. 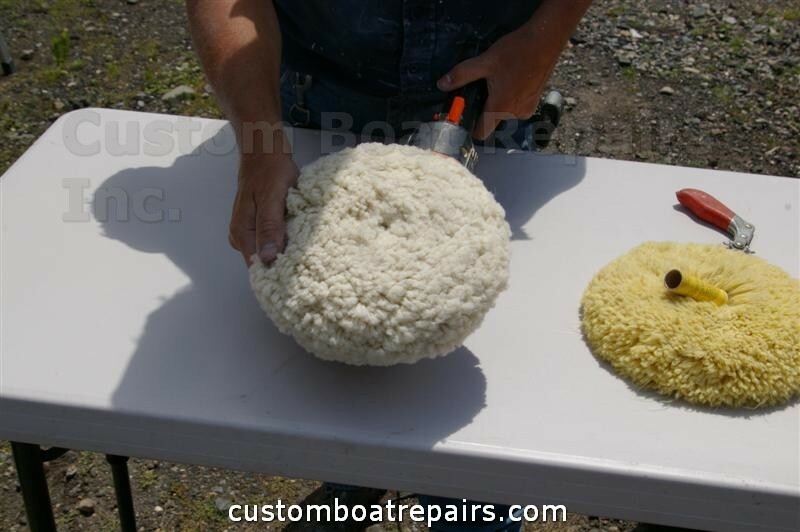 You’ll be compounding your boat maybe once a year, so this buffer should last you many years. You could go out and buy a more expensive commercial brand, but for such infrequent use, it seems a waste of money.